Sam Tomelleri sent us the following concept phone, that he calls the DUO X and apologizes for his use of a 2D design. That’s just fine, since we got the idea he’s using here. This model is supposed to have been inspired by HTC, LG and Oppo’s design’s. This model runs Android L and it has an interesting back camera that looks a lot like the one leaked for the Motorola X+1, if I’m not mistaking. There’s also a black area below the camera, probably the laser autofocus borrowed from the LG G3. Finally, this model integrates the front camera very discretely in the upper right corner and adopts very narrow bezels. Its specs include a 5.3 inch Quad HD display, dual front facing 1 W speakers and a Snapdragon 810 processor. There’s also Android L on board, in fact CyanogenMod 12 based on that OS, which is a premiere for a concept phone. At the back we’ve got a 16 megapixel camera with OIS+, dual flash and laser autofocus, as presumed. Finally, there’s a 3200 mAh battery inside and the design involves an anodized aluminum unibody case. 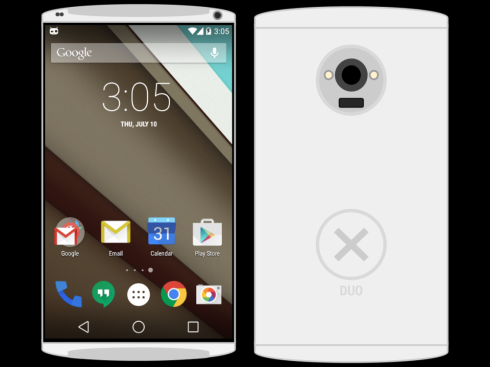 I’d see this as a new Nexus phone. How about you?